Anand Neelakantan is famous for visiting the popular mythological stuff from the other party’s perspective. Ramayana is written as Lord Rama’s story by sage Valmiki and carried forward in the same manner. Anand found that there are people in southern part of India who consider Ravana a diety. He even found a village where people worship Duryodhana, whom a majority of people consider the villain in Mahabharata epic, and hate him! These conflicting instances made him think that what could have been the stories if they were seen from the perspective of Ravana and Duryodhana. He thus came up with Ajaya (well, the Mahabharata is originally from the epic – Jaya) and Asura. His books are warmly welcomed by the readers and he was invited by S. S. Rajamauli to write books on Baahubali. His first book in the series – The Rise of Sivagami: Book 1 of Baahubali – Before the Beginning is well received. He was also associated with TV Serial Siya Ke Ram. Shanta (The Story Of Rama’s Sister) by Anand Neelakantan | Book Reviews. 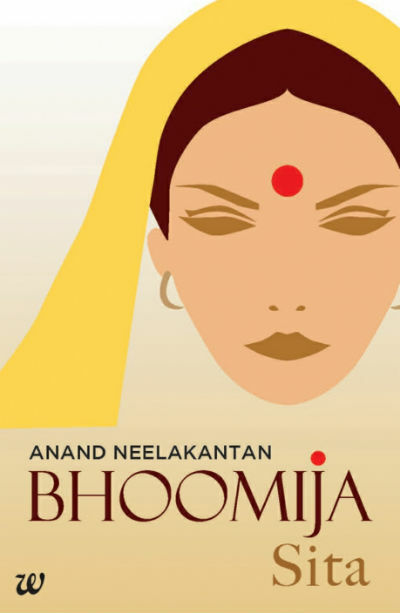 Let me present my views and reviews for the second short book in the series, Bhoomija: Sita. This book is very short, it consists of just 24 pages and on an average, you can finish it in around 30 minutes. The cover page of the book is an illustration of Lady Sita’s face. While it is simple and attractive, it looks horizontally unbalanced. Let us take a bird’s eye view look to the plot of the book. Well, I will try to avoid most of the spoilers, but eventually, you may find some of them, so please be warned. Once upon a time in the ancient era, in a jungle, there was living a Kraunch (common crane) couple. Kraunch is best known for its love for its partner. It is said that once they decide to remain partners with each other (similar to what we call marriages in humankind) they are inseparable. There are folklores around India being told where it is claimed that after one of them has died, the partner met with its death by crying uncontrollably or even attempting a suicide. Well, there may be some amount of fiction in that, let us rather talk about the plot of the book. Once a deadly snake came to know about the Kraunch couple and their eggs. The snake tried eating them, but, the Krauch couple attacked the snake together and saved the eggs. But, they knew that the snake will come again soon. Next time when it happened, the lady Krauch fought bravely with the snake, but without the help of her partner, she was unable to overpower the snake. The snake got its food and even able to bit her. She was sure that her death is coming slowly but surely, due to the poison of the snake. She soon senses some footsteps approaching her. It seems to be a human. Will he eat her? In that case, the death will come sooner than expected. But, no, she was not harmed! Why? Did the man found that she was bitten by the snake and eating her may be fatal for him? Will he leave her? Where is her mate by the way? Did he leave her alone by knowing that snake will attack again? What about their love, then? Isn’t loving someone means supporting and protecting him against all odds? If these are not enough questions, there were more characters and incidents introduced and make it seek answers for all them, which can be found only by reading this short book. Of course, the length of the book is very small and that can be considered as a disappointing factor for avid readers. However, some may find it is good to have shorts as they can be finished quickly! The story of the Kraunch couple is not new and those who know about the Ramayana in somewhat serious aspect is familiar with it. This incident is responsible to make saged Valmiki author Ramayana. The story is really well written and the incidents are explored really well. If you compare the writing of this book with the author’s first book – Asura: Tale Of The Vanquished, you will see a significant improvement. He became a better storyteller now. The characters are built so nicely that you will love to go in the flow of them and eventually you will forget what you’ve expected from the book! Yes, from the tile, you expect to explore some unknown facts about Lady Sita, the better half of Lord Rama; but the book rather talks about how sage Valmiki have decided to write the tale of Ramayana. The author, however, tried to justify the title of the book in the last segment of the book, but, for me, it is not convincing enough. I love the way the scenes are weaved. If the author is able to give you enough footage so you can visually build the scene in your mind, I consider it a success of the author. And, Anand achieves that milestone here. Eat what you catch until someone catches you and eats you, was the rule of the world. Men did the horrible things for the sake of material gains. They killed, maimed, and pillaged. Such men had to be reformed and for that, he needed to create a Hero. A perfect man, a man of great virtue. In this world that is an illusion, every emotion is real. In this world that is real, every truth is illusory. Nothing is right or wrong. What I like about the book the most are the changing perceptions of lady Kraunch and sage Valmiki with the experiences. If you are rigid with your perception, you are like the still water. Eventually, the clean water will be converted into dirty stench which everyone tries to avoid. People we see are the results of the circumstances they lived through and the experiences they passed through. Eventually, every good thing has a potential to become bad and vice versa. The author has explored it quite effectively. The normal price of the book is INR 25. However, I bought it during a promotional offer when it was less than INR 10.00. So, for me, it is definitely value for money book. If you want to read something short yet effective, or if you want to know about the incidents which are not from Ramayana but rather they prepared the plot of Ramayana, you will like to explore this short E-Book for sure. Remember to not to expect exploring some unknown yet interesting facts about Sita herself though.